Kelly Fields is the Chef Partner of Willa Jean in New Orleans. Growing up in South Carolina, Kelly’s passion for baking began at a New Orleans bakeshop before taking her to Johnson & Wales in Charleston. From there, she learned from iconic New Orleans chef Susan Spicer, a pivotal moment in her career. Next, Kelly gained extensive experience at the landmark restaurant August, and through travel around the world. 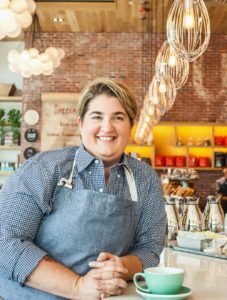 After stints in San Francisco, and back in New Orleans as Executive Pastry Chef for BRG Hospitality, she opened Willa Jean in 2015. Willa Jean celebrates Southern sensibilities with fresh, local ingredients. Kelly was named a semifinalist for the James Beard Award for Outstanding Pastry Chef in 2015 and 201 6and a finalist in 2017 and 2018. Kelly works to make a positive impact in New Orleans by developing relationships with regional farmers. In 2017, she launched the Yes Ma’am Foundation, which strives to provide opportunities within the hospitality industry for women across the South.